Today's cars are heavier, faster and more powerful than ever. To meet the demands of abuse, the new Weddle HV2 transaxles feature a mid-plate to reduce shaft flex and a mainshaft bearing designed to handle end thrust. Mid-plate support. 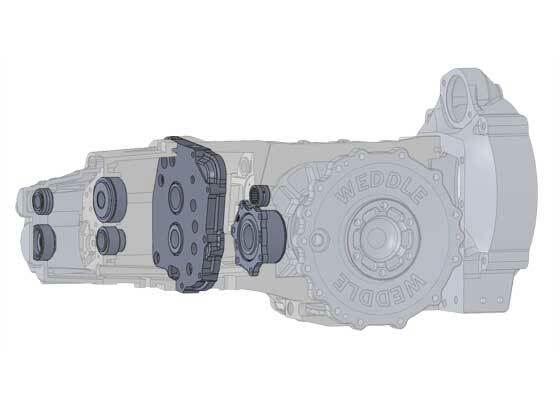 The Weddle HV2 transaxles are equipped with a mid-plate bearing support to reduce shaft flex. With the addition of the mid-plate every gear is located next to a support bearing in both the HV24 and the HV25. This extra support minimizes gear displacement under extreme loads, increasing the torque capacity of the gear box. Tapered roller bearings. In order to handle end thrust created by helical cut gears we added heavy duty double tapered roller bearings on the main shaft. These bearings are clamped in place by a mainshaft bearing retainer plate that is heat treated for durability and precision ground for an exact fit. These mainshaft bearings complement an ultra high quality pinion bearing assembly, this combination ensuring axial loads on both shafts are handled on acceleration and deceleration. Call 805 562 8600 or email us to find your nearest dealer.